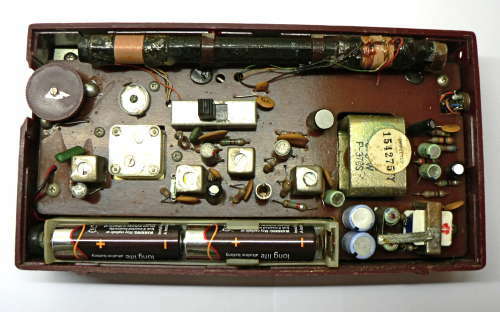 Pye model 1371 Portable eight transistor radio housed in a maroon plastic case with aluminium fascia. The '8 transistor' on the fascia is a marketing ploy, there are indeed eight but one is wired as a diode which functions as a detector! 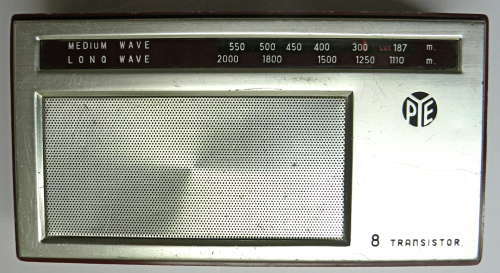 This radio is electrically similar to the Pye 1369 and the Ecko PT302. It covers 187-550 metres on the medium waveband and 1110-2000 metres on the long waveband, selected by a switch on the rear. The tuning scale is calibrated in metres but does include one station name, that of Radio Luxembourg. The tuning and volume controls are mounted adjacent to each other on the right hand side. An earphone socket is on the other end. The set is powered by four 1.5 Volt AA cells housed in a removable plastic battery box. The transistors manufactured by Sanyo are as follows 2SA201A, 2S2202D, 2SA198P, TG48, 2SB270, 2SB270, 2SB187 and 2SB187. This set working and was made in Japan in about 1967.